Microsoft has been making the same case for a while. Very little about Web-based email has changed since the arrival of Gmail, and it is time for something better. It’s the case Microsoft made several years ago when it overhauled Hotmail, and the same one it made when it offered a significant update to Hotmail. That said, Hotmail is still seen by many as decidedly unhip, particularly in the U.S. Rather than attempt to give Hotmail another face-lift, Microsoft is introducing an all-new Web service, to be dubbed Outlook.com. “We decided it was time for a new email service,” Microsoft’s Brian Hall told AllThingsD. Under the hood, many of the features of Outlook.com are carried over from the latest iterations of Hotmail. The biggest change to the service is the appearance of the inbox, which now looks much more like a desktop program, with fewer and smaller ads. For now, Hotmail and Outlook.com will coexist, but over time, Outlook.com will become Microsoft’s only Web mail service, with Hotmail’s users transitioned to the new service. “We will move all Hotmail users, just because it is a hell of a lot better,” Hall said. However, the first goal, Hall said, is for Outlook.com to attract tens of millions of new users — folks like young people and tech enthusiasts who haven’t been joining Hotmail in recent years. There were a variety of issues with Hotmail, Hall said, ranging from its stodgy brand perception to the fact that it had lots of in-your-face banner advertisements. Outlook.com features some advertising in the main inbox, as well as in messages from unknown senders. When a message comes from a known contact, the small ad space on the right hand side is replaced instead with contact information, as well as context-specific ways to engage with that person. With a Facebook contact, for example, Outlook.com users can see their latest status update and reply. 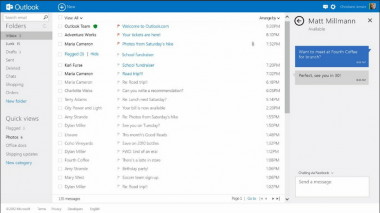 Another feature of Outlook.com is its unified contact system, bringing together all the information one has about a person, whether from Microsoft or a third-party service like Twitter, Facebook and LinkedIn. New users can get an Outlook.com e-mail address, while existing account owners can transfer their account while keeping their existing Hotmail.com or Live.com address. 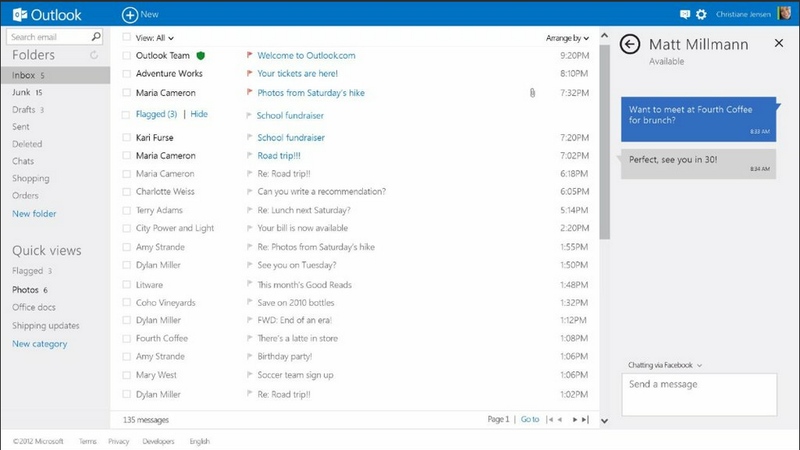 In a future release, Hall said, Outlook.com will also get the ability to make Skype video calls directly from within the inbox. Hall declined to say what Microsoft’s expectations are for adoption of Outlook.com, but said the company is building the service to work for a billion or more customers. “Our expectations are pretty high as far as people liking it,” he said.